Log on as the User and run the application call insfixreg.exe from the command prompt. This should be located in the Insure++ installation directory. This will allow all Users to see the Insure++ toolbar as well be able to instrument their projects. There are times that the above method won't allow users to see the Insure++ toolbar. 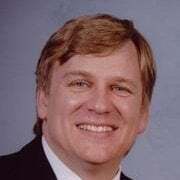 The reason is not because of Insure++, but may depend on how the machine's path is setup. insfixreg.exe utilizes the Microsoft program called "regsvr32.exe". If the Microsoft Windows Operating System you are using is a 64-bit platform then "regsvr32.exe maybe installed on a couple of locations. Keep in mind that Visual Studio is a 32-bit application, so we need to be able to run the 32-bit version of regsvr32.exe. Start Visual Studio and the tool bar should be there. The above may no longer apply to Insure++ version 7.4.10 and above, due to the fact that an entirely new plugin was created. After running the installer for Insure++ and it has successfully installed, switch to the User you want to use Insure++ with. Once you have opened the Insure++ installation directory, open the 'bin' folder and run the "VSInsure" application. A new window will appear, this will register Insure++ with the User so it can be used in Visual Studio. The only time you will need Admin permissions is when you are going to access the Insure++ control Panel. 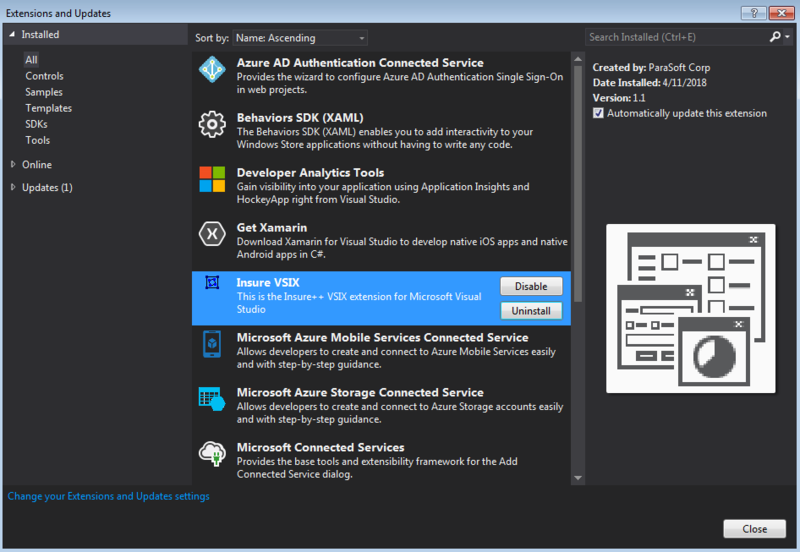 Open each Visual Studio IDE that Insure++ was installed on. 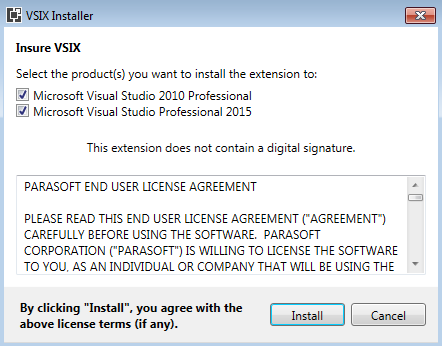 After the new window opens, locate the "Insure VSIX" extension and click on the uninstall button. Once that is performed, proceed with the normal uninstallation process for Insure++. You will need perform steps 1-3 and for each User that installed Insure++.